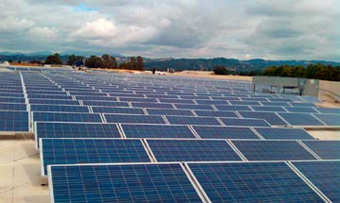 SANTA ROSA — Mesa Beverage Co. Inc. is having a 415-kilowatt solar electricity system installed on the roof of its recently built 160,000-square-foot distribution facility near Charles M. Schulz-Sonoma County Airport. 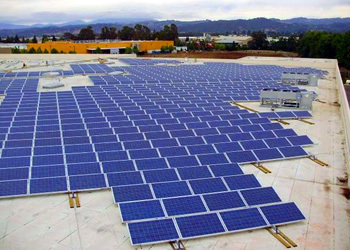 The photovoltaic panel array will supply almost 10 times more of the facility's annual electricity needs than were required under the county of Sonoma’s conditions of approval for the project, according to Marc Herculson, executive vice president of Mesa’s parent company, Liquid Investments of San Diego. "As a condition of approval from the county, we were asked to eliminate the increase in greenhouse gas emissions from our new building," he said, referring to construction of the facility, which was completed in June 2009. "Our solar project will not only satisfy our agreement with the county but [also] will annually reduce emissions by over 735,000 pounds of CO2 each year." System integrator Sunlight Electric LLC estimated that the system will offset 75 percent of Mesa’s annual electricity usage, saving the company $180,000 a year. The array will take up 75,000 square feet of the roof, based on 48,000 square feet of module area plus spacing to avoid the panels’ shading each other from a 20 degree southward tilt. 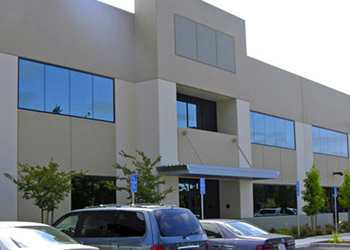 Shamrock Renewable Energy Services Inc. of San Ramon is expected to complete installation in December. The solar array was purchased outright rather than brought in through a leasing or other financial arrangement to provide the highest internal rate of return, according to Mr. Herculson. However, the more than $2.25 million project was put off from the $20 million-plus facility project itself because construction costs and legal fees were much higher than expected, he said. What was expected to be an 18-month process from the purchase of a 19.5-acre parcel on North Laughlin Road east of the airport that had been master-planned for industrial real estate to building the structure ended up taking three years. A nearby resident appealed project approvals twice, and five major revisions of the environmental document were prepared. The neighbor then sued the county to halt construction. "We were determined to go solar and reinforced the roof for solar during construction but delayed the actual solar installation until later," Mr. Herculson said.